In the early 1800's there was an American painter named Edward Hicks who became fixated on the eleventh chapter of Isaiah. He painted a child with his arm around a lions neck, his fingers twirling the mane and at his feet a wolf lay with a lamb and a leopard and goat and behind them a big brown bear and all were at peace. He painted this same image over sixty times, with a variety of backdrops and arrangements of the characters — but always a diverse group of normally competitive creatures were at peace. 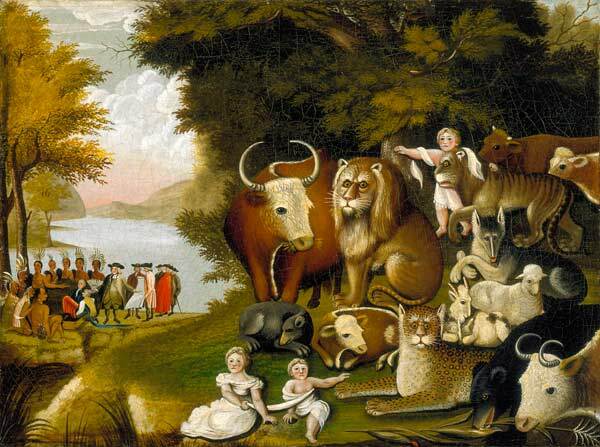 The paintings all have the same title; The Peaceable Kingdom. The commitment to be peace makers lies at the heart of everything Jesus and Isaiah teaches. I believe that peace is possible in every situation. No matter how conflicted your family or workplace is, peace can be achieved. I have seen dogs and cats lie down and sleep on the same bed. We are not to be ruled by our competitive animal natures. I believe that peace is possible, even in lands which have long known conflict, like the Middle East. I believe in peace. What is the alternative? Further, I believe that being a peacemaker requires me to learn how to control my own inner conflicts. I need to learn mediation skills. I need to apply what I know about family systems to the social systems that I am a part of. I am never released from the obligation to be a peace maker.